Jon Danzig's World: Daily Express business model: selling prejudice and bigotry? Daily Express business model: selling prejudice and bigotry? Imagine an imaginary scene in Dragons' Den, the popular BBC TV programme where millionaires decide if they'd like to invest in the business plans of 'wannabe' entrepreneurs. And here comes Richard Desmond into the Den with an investment opportunity for his newspaper called the Daily Express. "So what’s your idea, Richard?" asks one of the Dragons. “Well,” said Richard. "This newspaper I’ve acquired has a brilliant reputation for selling scandals and gossip. “Oh, just £125 million,” he replied. Everyone in the den laughs, somewhat nervously. “Any ones we might know?” asked a Dragon, with a twinkle in his eye. “Well, there’s ‘Asian Babes’ and ‘Big Ones’,” replied Richard. Er no, no, muttered all the Dragons in a quiet but embarrassed whisper. “Well,” responded Richard, his eyes glistening. 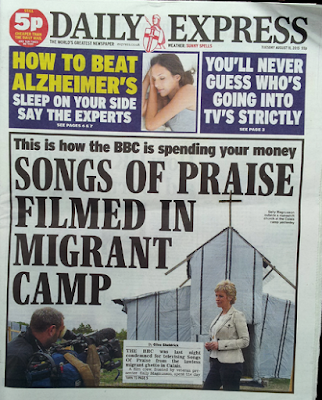 “Stories for example that show migrants and asylum seekers in a really bad light. Our readers are proudly British and really don’t like foreigners. So our stories excel at pandering to that prejudice. “But can you really sell stories based just on disliking foreigners and the EU?” asked a Dragon, looking a little incredulous. “Oh, well we do other stories that also appeal to this particular market segment and customer base,” continued Richard, the Dragons looking on, appreciative of his use of business jargon and terminology not often expressed in the Den by those seeking investment funds. Richard laughed. “Oh not really,” he replied. Richard closed his eyes and momentarily bowed his head. “Numbers Richard, we need numbers,” chirped yet another Dragon, tapping his pen on his chair. “What’s your circulation? Turnover? Profit? Come on, we need to know!" “Oh well that’d be the Daily Mail,” replied Richard, looking down on all the Dragons now sprawled on the floor. The Dragons all fell over again. “You’re richer than me!” gasped one of the Dragons. “Me too!” groaned another. *Richard Desmond's company, Northern & Shell, bought Express Newspapers in 2000. It's been reported that newspaper publishers, Trinity Mirror, is negotiating to acquire the Daily Express in a deal that might be completed by the end of 2015.